Transactions with horses and ponies frequently end in litigation. There are no regulations or laws that protect the buyer, so the onus is on the buyer to make sure that the horse is suitable. However, few horses are perfect and sellers will naturally avoid telling you of the problems. Up to a point, you can rely on a vet for checking medical health, but a vet can easily get it wrong, since he can only assess the horse at a single point in time with limited information. Of course, a vet cannot tell you anything about the horse's temperament, ability or suitability to you. The only way of protecting your interests as a buyer is to use a sale contract in which the seller warrants (makes promises regarding) the condition of the horse. If subsequently it turns out that a warranty (for example, that the horse does not spook at traffic) is false, the seller breaches the agreement, and the buyer can seek damages. Of course, every seller will tell you verbally that the horse is sound. But if it is written down, if there is a problem (whether the seller knew of it beforehand or not), it becomes the seller's problem, not yours. This agreement protects both parties, but more so the buyer, who is in the weaker position without it. It has been written for transactions where the consequences of buying an unsuitable horse are expensive and the buyer wants a comprehensive agreement to provide him with the greatest amount of protection. This horse sale contract is suitable for transactions where the buyer needs protection against the horse being medically unsound or not being in the condition the seller describes (such as having vices that weren't disclosed). The agreement could be used to buy any horse, including those for general recreational use, sport horses, racehorses, stallions and brood mares. You can easily remove provisions that you think are unnecessary in your circumstances, or add additional ones that you might require. This document is suitable for international sales. The seller may be reluctant to use a formal document. This may be because he is reluctant to provide a warranty, or there may just be other potential buyers with better terms. In these situations you may have to judge whether the risk of removing a provision (or not using a document) is worth taking. As far as possible, we have drawn the agreement so that both sides will be happy to use it (there are benefits for both parties). For example, our use of plain language (and lack of legal jargon) should ensure both sides understand the agreement, and reduce any worries about what exactly the seller is promising. 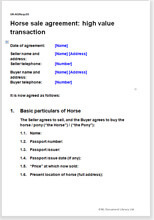 If you are worried that this document may be more than you need you may be interested in looking at: Horse sale agreement: buyer's version. The agreement is based on this one but has been edited to contain just those provisions that are likely to be needed when buying a horse for recreational use. If you are the seller, you may prefer to use an agreement that still protects both parties, but that offers the buyer less protection than this document. As a seller, using a sale agreement is a good way to reassure a buyer and close a sale, and presenting yours allows you to set the terms and warranties. See Horse sale agreement: seller's version.